Coupes are, by definition, 2-door vehicles. The smallest Mercedes-Benz sedan comes in “stylish 4-door coupe” clothing, according to the manufacturer. So you’ll have to be flexible when considering this whole concept. Click on any picture if you’d like to see a larger version. The best way I can describe the CLA’s styling is that it’s a baby version of the CLS, Mercedes’ big “4-door coupe” design. The lines are swoopy enough to fool some eyes into missing the rear doors, and give it a bit of a squishy profile. It’s not for everyone, but I found that nearly everyone who looked at it found it attractive. A couple of people didn’t appreciate it, saying it looked like a melting jelly bean. Personally I like the CLA’s side profile and the interesting character lines that have been added, drawing your eyes along the fluid shape. 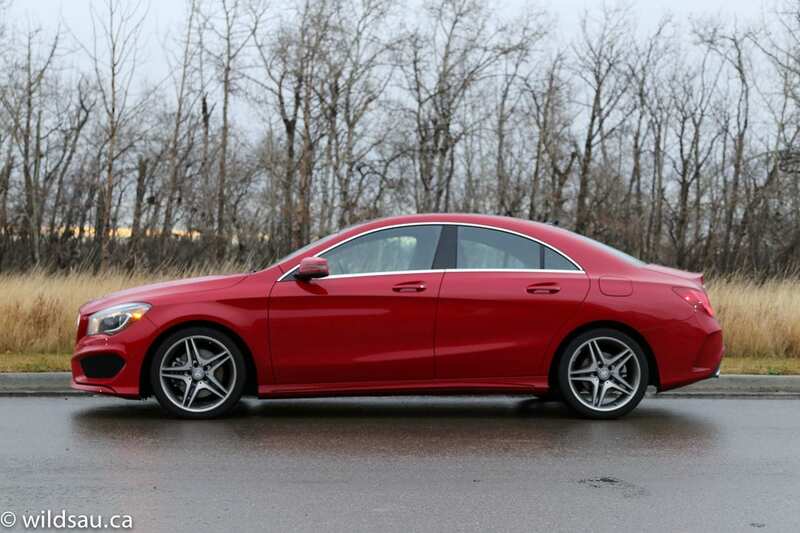 While the CLA is only the size of a Honda Civic, it comes across as a bigger (and much nicer) car thanks to the styling. 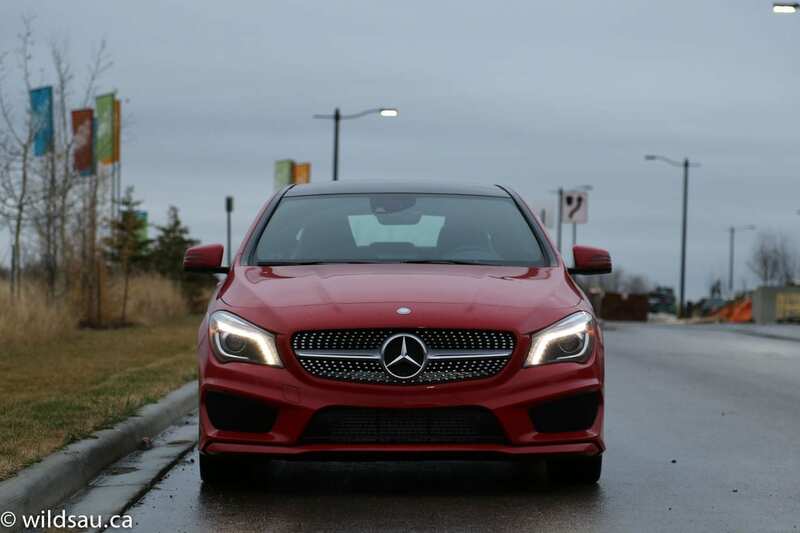 The front end gets a very innovative grille design (sporting a massive three-pointed star), aggressive gaping lower intakes and a striking LED running light signature that you can see a mile away. 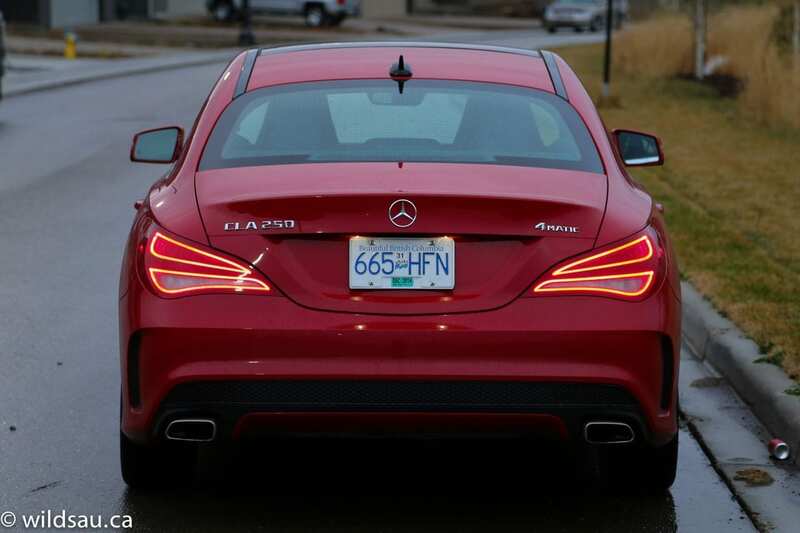 Likewise, Mercedes did a great job with the tail lights. I had a number of people come up in my underground parkade at work, saying the car had the coolest tail lights they’d ever seen. 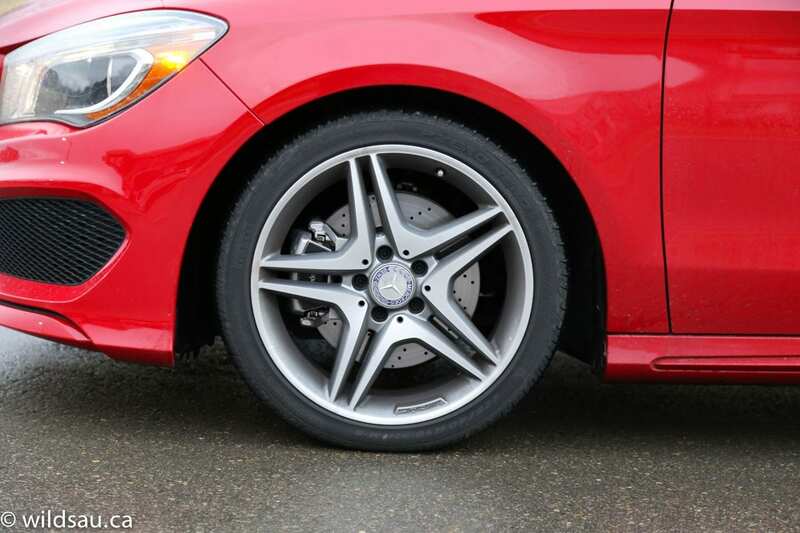 The 18-inch wheels are handsome and suit the car’s sporty character – they’re wearing 225/40-sized tires. 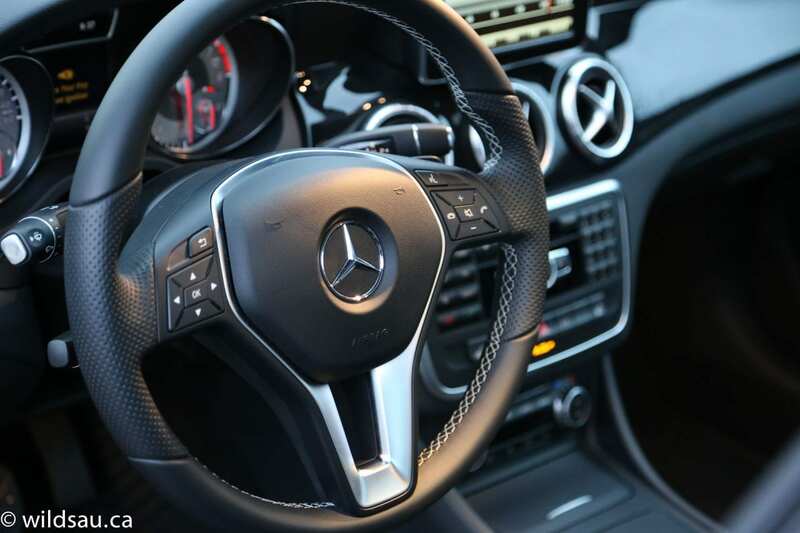 If you’re in Canada (or anywhere but the U.S. for that matter) and you’ve seen the current generation B-Class, you’ll find a very familiar cockpit. The CLA is built on the same platform, and shares many parts. It’s a new approach for Mercedes in that it’s sportier than you might expect. Gone is the stodgy approach of yesteryear’s Benz products. There’s a blend of hard buttons, a floating screen and rotary knobs. The screen is controlled solely with the COMAND interface, a rotary joystick knob and a back button. It’s not intuitive from the get-go, but is easy to learn and makes sense once you adjust to it. 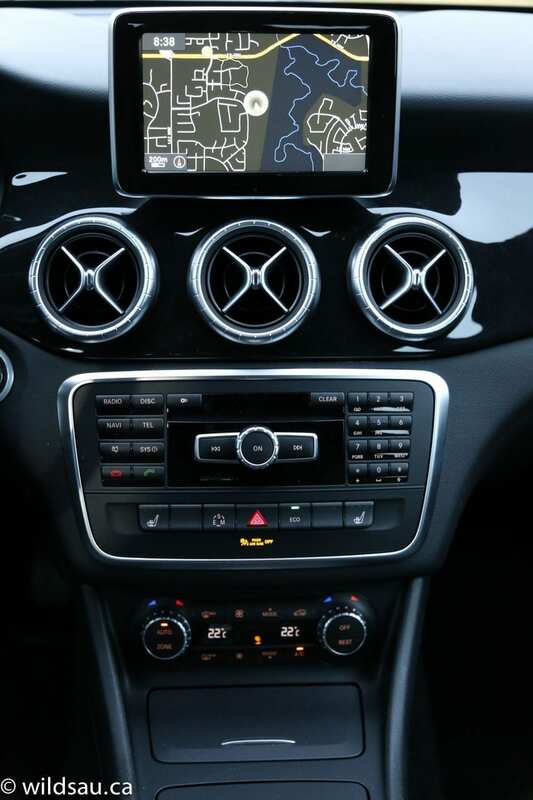 Basically everything is managed on the screen – the audio system, the phone functions, vehicle settings and the navigation system. And yes, the goofy numeric keypad is still there. Thank you, 1995, for your contribution. Materials are nice – virtually everything is done in soft-touch plastics. The heated, power adjustable seats (three memory settings for each side!) 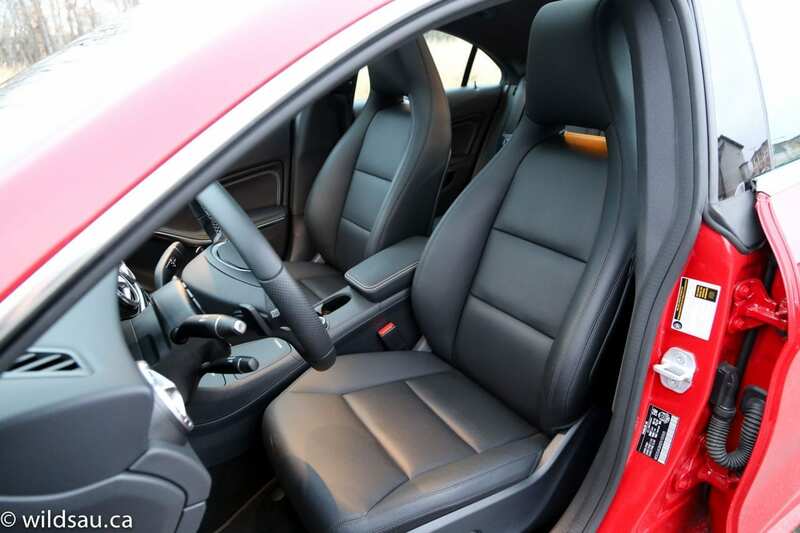 are a great combination of comfortable seating and supportive grippiness for sporty driving. They also look fantastic – casual onlookers might think you dropped a set of Recaro seats into your CLA. I love the steering wheel – it feels fantastic and is as comfortable for commuting as it is for carving corners. 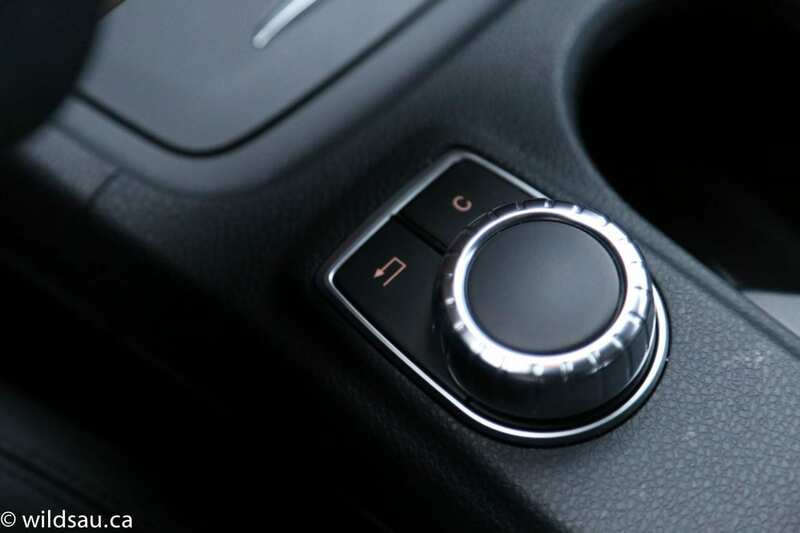 Mercedes puts its gear selector on the steering column, which takes a day or two to get used to as well, but it frees up more real-estate in the centre console. My family loved the ambient lighting around the cabin. Soft orange glows from many of the nooks and crannies and it looks great. 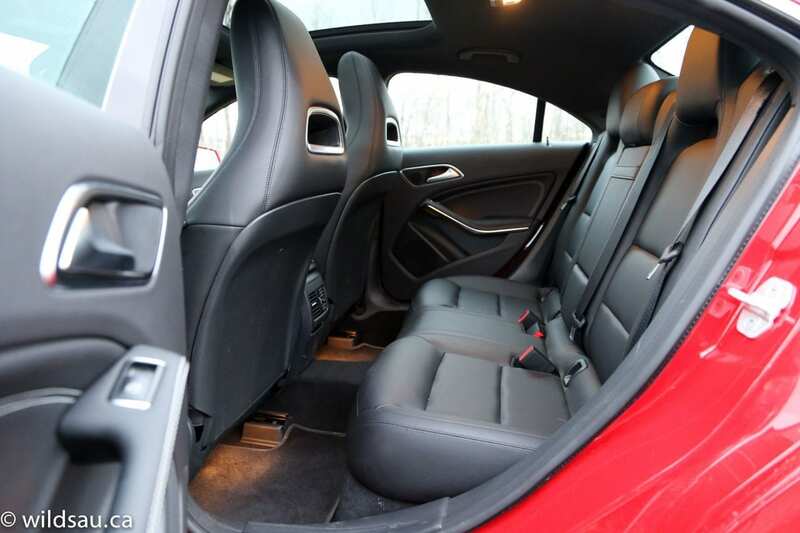 Getting in and out of the back seats is a great reminder of the car’s “coupe” profile. The tighter entrance is one of the prices you pay for that slick look. You’ll continue to pay the price once inside. Head room and leg room are limited, and at 5’10”, I found myself pushing the limits. Our three kids fit in the back fine. The middle seat is OK for kids, but they’ll have a straddle a significant drive-shaft tunnel in the floor. Adults won’t want to spend much time in the back of the CLA period, and a road trip will likely call for a lot of patience and tolerance. Rear passengers get a 12V plug, adjustable air vents and the all-important ashtray. The console has a few cupholders and storage bins, as well as some space below the adjustable armrest lid. 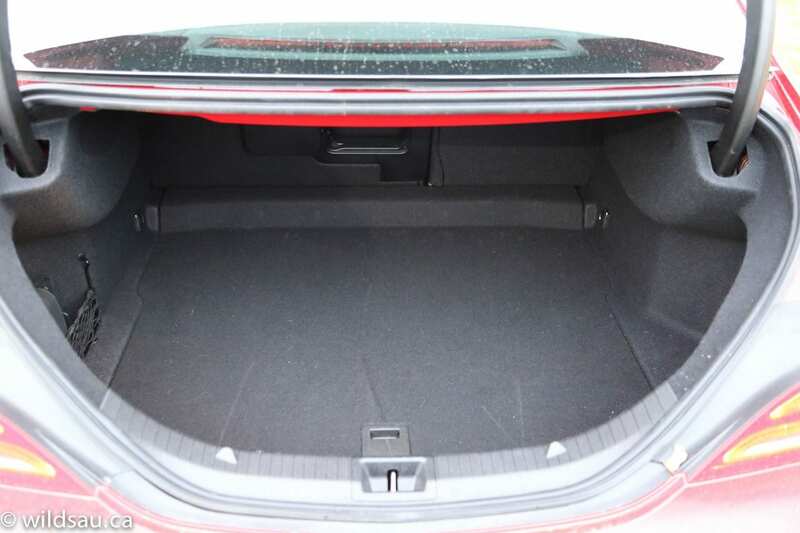 The trunk is actually a decent usable size at 470 litres, and the trunk lid can be released from the dash, a button on the trunk lid itself or a button on the key fob. 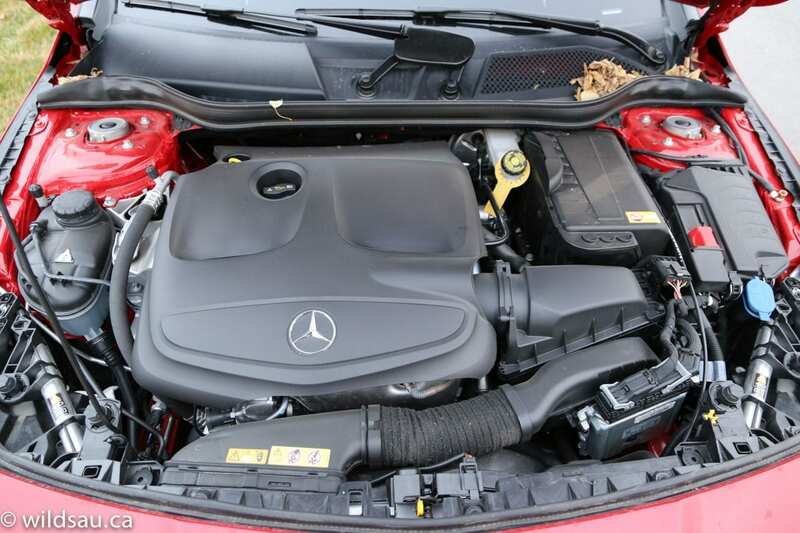 This platform works with a turbocharged 2.0-litre 4-cylinder engine. Putting out 208 horsepower at 5500 RPM and more importantly, 258 lb.ft of torque at a low, low 1200 RPM, it feeds all four corners through a 7-speed dual-clutch automatic transmission. Fuel economy for this little 3263 pound sedan is rated at 7.8 L/100 km (30 US mpg) in the city and 5.1 L/100 km (46 US mpg) on the highway. I ended up averaging a significantly higher 9.9 L/100 km (24 US mpg), though I was often driving with a heavier-than-average foot. 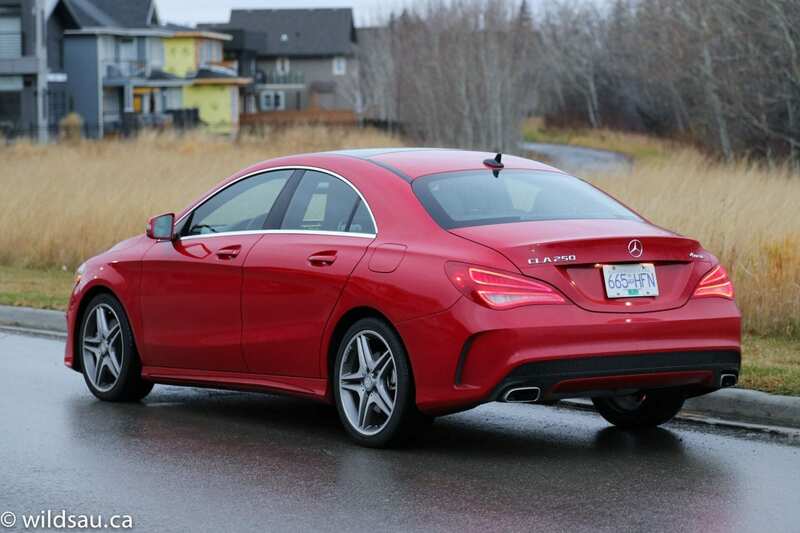 The regular driving mode in the CLA is fine to putter around town with. You will likely find yourself surprised at how mild the power plant seems. Where’s all that torque? It’s programmed to sip fuel, and if you’re driving normally, you’ll find the gearbox immediately flying through the gears and you’ll often be lugging around at 1200 RPM, sitting in 6th gear before you know it. It’s all fine until you want to pass or get into some quicker-moving traffic. 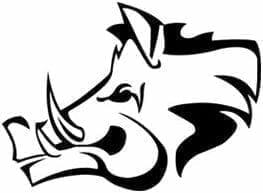 Then the drivetrain’s hesitation to shift down and the time it takes to spool up the turbo and let you dip into the prodigious power can be frightening, often making it seem like you won’t get going in time. It takes some getting used to, and I learned that it’s easy to access the power if you step on the gas more than you normally would. It seems that a good jab at the throttle fires up a different driving program and causes the vehicle to be a tad more aggressive. Better yet, just put the car in Sport mode. Throttle response and transmission programming join forces to make the driving experience far more involved and less laid back, and I found it quite satisfying. Punch the gas, and the car launches smartly off the line, pulling off the 0-100 km/h sprint in a respectable 6.7 seconds. It feels even faster. Mercedes’ 4MATIC all-wheel drive system is impressive here. Completely invisible during normal driving, it kicks in to add balance and confidence when driving the car quickly or on wet, slippery surfaces. 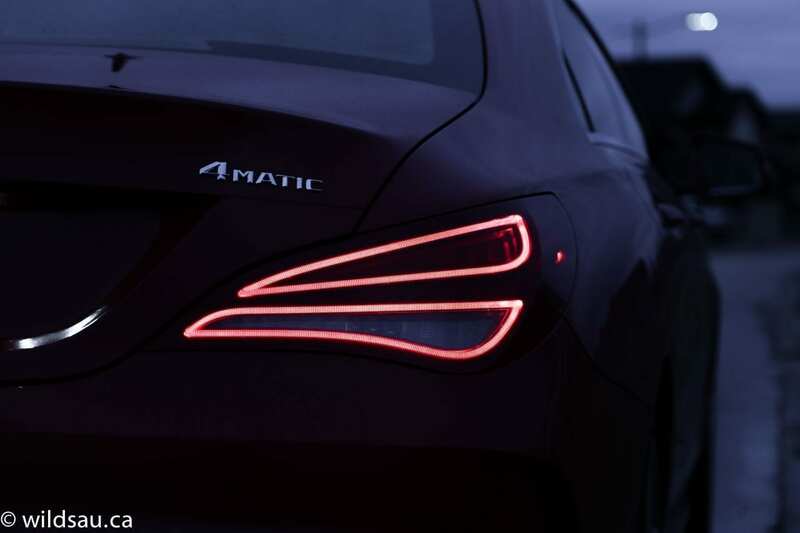 The CLA’s sportiness continues when it comes to the ride. It is quite firm, and while it’s not jarring, it is definitely aimed at a new demographic. If you’ve driven past Mercedes models, you won’t find that level of suspension comfort here. The flip side is that the CLA has wonderfully neutral handling, staying quite flat in corners and biting into curves with aplomb. It can be a hoot to drive aggressively, aided by a quiet but snarly engine note. I found the electronic steering to be a bit dead, and wished it had more feedback. Speaking of noise levels, the car is impressively quiet, except for some significant road noise that showed up only on certain rougher surfaces. Because it’s so variable, I attribute it to the tires. What you’ve got in the CLA 250 is a small Mercedes done well. There’s enough of the Mercedes brand’s style and refinement, but they blend it with some newfound sportiness that will surprise some. It’s styling is pretty much love it or hate it, and presents aggressively from many angles – not what we’re used to from Benz. The interior’s youthfulness and fresh styling will catch many shoppers familiar with the brand off guard but it offers plenty of comforts, technology and refinement. WAF (Wife Acceptance Factor) was quite high. Mind you, she’s a bit biased, since her everyday driver is nearly identical inside and has the same power plant. But as much as she liked the CLA’s styling and as familiar as the cabin felt, she didn’t like how tight the back seats felt for our kids, and she prefers the B-Class hatchback to the CLA’s trunk. 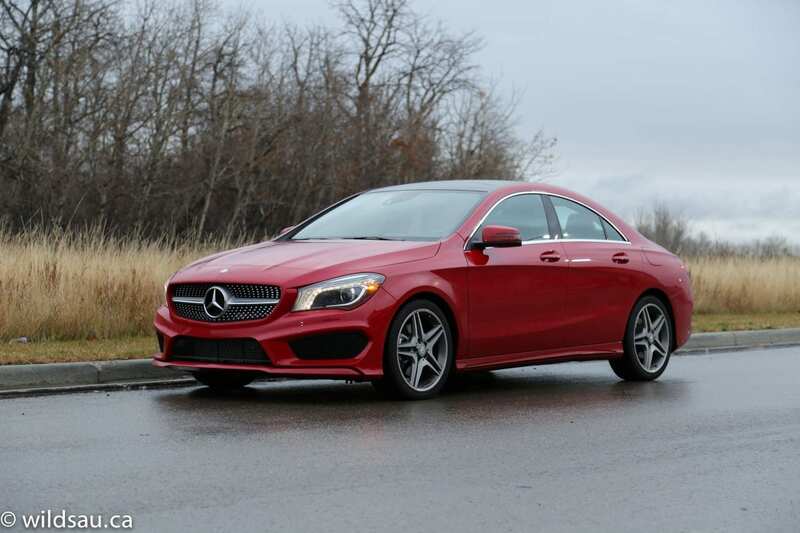 With the CLA’s pricing starting at an aggressively low $34,300, Mercedes has found a whole new generation of buyers and this model has sold well. If it’s a three-pointed star you’re after, this is a decent way to get into it. Yes, there are better equipped vehicles out there for the same price. Yes, you can get more room inside plenty of vehicles in this price range. There are compromises any way you look at it. But the CLA ends up offering plenty, even at the base level, and combined with the cachet of the Mercedes marque, it seems that it’s exactly what many buyers have been looking for. The CLA has certainly opened up the brand for many new buyers. Consider it a gateway drug.